AS WELL as a cheque for $700, a knowing look passed between Hassan Bashir and Bashir Mohamed, his 80-year-old father. 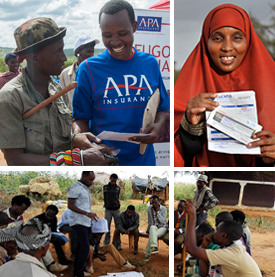 A payment at a ceremony for herders in Wajir, a town near Kenya’s border with Somalia, settled an argument dating back to 1997, when the son moved into the insurance business. Mr Bashir, born into a cattle-herding Somali family in the rugged north-east of Kenya, was told that his career choice was not only odd but un-Islamic. Many imams say that sharia law does not sanction conventional insurance, deeming it to contain elements of gambling….watch video….